New Plants, Specials, Announcements ! King David 5 gal. $45 New! Castanea pumila, Chinquapin nut tree, also called Dwarf Chestnut 2 gal. $15 Yellow flowers in spring are fragrant. Nuts edible and much sought after by wildlife. Tomatoes, peppers, broccoli, cauliflower, cabbage are in. Note! Nursery will be closed Wed Aug 15th and Thurs. the 16th. We will be open Friday and Saturday. The following gingers are now available! All are 1 gal. $15. Unusual evergreen tree in the Norfolk pine family with zigzag branches. Cold hardy, slow growing, hard to find interesting pine. 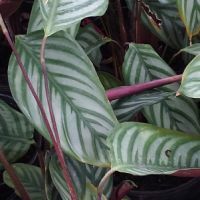 Aphelandra hartwegiana, 2 gal. $25 - unusual orange spikes with yellow blooms 15in. long on this large leafed unique tropical shrub. Blooms fall and winter, rare to find. New plant for us! Ficus lyrata Fiddleleaf Ficus 1 gal. $15 - Easy, hardy house plant or patio pot plant. Jasminum multiflorum - 2 gal. $15, Full spreading tropical shrub jasmine, everblooming starshaped white flowers. Pinwheel jasmine, carnation of India are common names for this hardy shrub. It likes full to part sun and blooms lightly scented pinwheel flowers. Grows 5 to 6ft tall. This bushy tropical shrub has single white flowers atop dense dark green foliage. Flowers are fragrant and blooms constant. 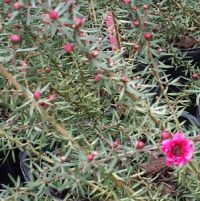 Beautiful hardy plant, prefers part shade and attracts hummingbirds with its tubular orange flowers. Fall blooming and only gets about a foot tall. Neat perennial! Sweet potato plants(edible) 4½" pots $3.50 - Puerto Rican bush type. Bushier type that doesn't take up as much space as traditional vining type. Large fragrant white greenish flowers on this shrubby small tree from the Dominican Republic. Blooms repeatedly, fragrance is said to smell like warm chocolate. Tropical and rare! We had to repot some tropical fruit trees to bigger pots to keep from blowing over. All the tropical fruit trees $50 size from 3 gal. to 7 gal. Gruichama cherry are now in 2 gal. with same $30 price. Please note that due to the 2017 hurricane in Florida, there is a price increase this year on all tropical fruits. Sold out: all lemons, limes, and satsumas! Sold out: Spicebush 1 gal. Pakistan Mulberry 15 gal. $75 5/8"
Florida Prince Peach 15 gal. $65 1" cal. Cookes jumbo Quince 7 gal. $45 New this year!